The use of flexible sheets and films in the packaging industry has been present for a substantial amount of time, but has seen commercial success only in the recent decades. Modern flexible packaging provide varying levels of flexibility while maintaining the highest level of durability possible, keeping their primary job of protecting the contents. These factors have strongly championed the use of flexible packaging in the ASEAN regions, where high population density, growing consumerism, increasing need for brand appeal, and the savings in size of package and space that they can achieve. The ASEAN flexible packaging market is likely to show an optimistic CAGR of 5.7% within a forecast period from 2016 to 2024. It is expected to reach US$6.71 bn by the end of 2024, from its valuation of US$4.32 bn in 2015. The primary propellant for the market currently is the large scale consolidation efforts taken by the leading players in the market. The market also benefits substantially from factors such as economic advancements in the region, increasing rate of investments by multinational players, and dynamic characteristics of the population. Megatrends such as the flourishing modern retail industry and the increasing growth of food and beverages industries is also contributing to the growth of the ASEAN flexible packaging market. Food and beverages in the ASEAN region takes up a majority of the market for flexible packaging. Therefore, product development efforts initiated by manufacturers of flexible packaging in the ASEAN region are targeted towards key food and beverages clients. Based on ASEAN nations, the flexible packaging market has been segmented into Indonesia, Thailand, Malaysia, Vietnam, Philippines, and Myanmar. Indonesia is currently estimated to constitute the leading share in the ASEAN flexible packaging market, with Thailand in second place. The markets in Philippines, Vietnam, and Myanmar are likely to show a relatively higher growth rate over the coming years. GDP growth and a rise in disposable income in the ASEAN region will play a key role in propelling the demand for flexible packaging over the coming years. Over the coming years, the ASEAN flexible packaging market is forecast to swing from single layer packaging to multilayer variants. The latter segment can be divided further into two layers, three layers, five layers and seven layers. Five-layered flexible packaging and seven-layered flexible packaging are expected to take up the greater shares in the overall market for the given forecast period, with the market segment on the basis of layer types. However, the multi-layered packaging segment currently shows greater barriers to growth, such as high costs of manufacturing and overall reluctance of consumers to purchase the items with costlier packaging. The promotion of this segment as a highly hygienic and safe option for packaging of food products is likely to boost its demand over the coming years. Based on products, the ASEAN flexible packaging market can be divided into pouches, bags, films and rollstocks, and other flexible packaging products. Pouches took up the leading share in the market in 2015, in terms of demand volume and growth rate. This segment is additionally expected to remain a highly attractive over the forecast period. The pouches segment is further divided into standup pouches, retort pouches, and vacuum pouches, among which standup and retort pouches are forecast to show a profitable future. The segment of bags is divided into wicketed bags and gusseted bags. The leading players in the ASEAN flexible packaging market so far, have included Sonoco Products Company, Bemis Company, Inc., Amcor Limited, Constantia Flexibles GmbH, Mondi Group, Berry Plastics Group, Inc., and AR Packaging Group. The market for flexible packaging in Association of Southeast Asian Nations (ASEAN) has been analyzed in great details in the report with a comprehensive forecast regarding the potential growth prospects of key segments and regional markets over the period between 2016 and 2024. The market has expanded at a steady pace in the past few years and is expected to continue to register a strong CAGR over the report’s forecast period as well. The market has earned itself a prime spot in the region’s overall packaging industry and currently holds nearly 50% of the overall packaging industry. The report presents a detailed evaluation of the market and its growth prospects, performance in terms of revenue, and an overview of the key challenges, trends, drivers, and restrictions in the form of regulations affecting the overall development of the market presently and the potential impact of these factors on the market in the next few years. The report also includes vast qualitative as well as quantitative data regarding past and present product consumption patterns. A number of factors are working in favor of the ASEAN flexible packaging market, including the thriving food and beverages and retail industries. The market has also majorly benefitted in the recent years owing to the vast rise in population, rising disposable incomes, and a healthy expansion of several industries in the region. With the rise in manufacturers of a variety of goods, ranging from food and beverages, medicines, medicinal devices, personal care products, cosmetics, sports products, and homecare products, the demand for effective, safe, and cheap packaging technologies has also soared. Vast benefits of flexible packaging in all these areas, possibility of incorporating various materials, advanced designs, and easy use make flexible packaging the most preferred packaging technology in the region. The report segments the ASEAN flexible packaging market on the basis of criteria such as product type, layer type, material type, end use, and region. On the basis of product type, the market has been segmented tin pouches, bags, and films and rollstocks. The segment of pouches is further examined for varieties such as vacuum pouches, stand-up pouches, and retort pouches. The segment of bags is further examined for segments such as wicketed bags and gusseted bags. In terms of the number of layers that make a flexible packaging product, the report segments the market into mono layer and multi-layer. The key varieties of materials used for manufacturing flexible packaging products examined in the report include polyethylene (PE), polypropylene, polystyrene, and nylon. The segment of polypropylene is further segmented into bi-axially oriented polypropylene (BOPP), copolymer polypropylene (COPP), and oriented polypropylene (OPP). The key end-use industries utilizing flexible packaging products analyzed in the report include pharmaceutical, food and beverages, cosmetics and personal care, sports goods, and homecare and toiletries. The market is examined for all countries in the region. 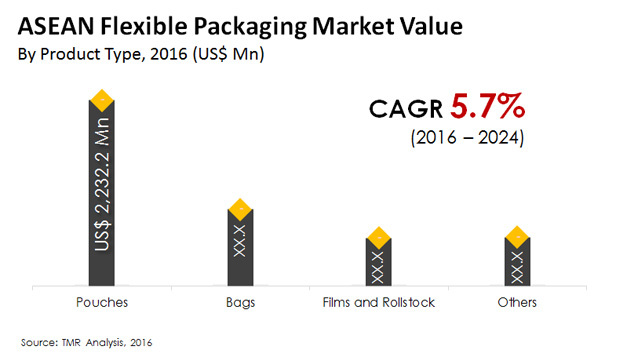 The report also presents a thorough overview of the competitive landscape of the ASEAN flexible packaging market. The competitive dynamics of the market is examined with the help of details pertaining to leading vendors in the market, recent developments, and the intensity of competition. Some of the leading companies in the ASEAN flexible packaging market examined in the report are Bemis Company, Inc., AR Packaging Group, Mondi Group, Berry Plastics Group, Inc., Amcor Limited, Constantia Flexibles GmbH and Sonoco Products Company.